Once upon a time, bathrooms were small and utilitarian, often retrofitted, and tucked away in odd spaces. Not until the 1950s did a majority of bathrooms in the U.S. include hot and cold running water, a flushing toilet and tub or shower. 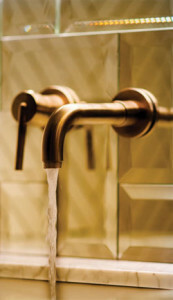 The world moves fast and keeping up with the ins and outs of design trends is dizzying: brass fixtures were in, then they were out, now they’re in again. Wall-to wall carpet (really!) was once all the rage. Jacuzzi tubs were in for a time; now they’re decidedly out. 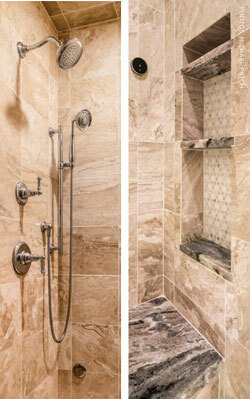 Bath designs today are practical, individualized and luxurious to the extent budgets allow. 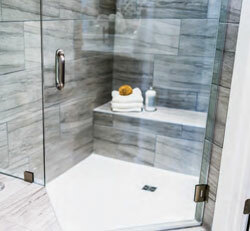 Area designers agree on current bath trends: most-wanted lists include spacious showers with large benches; his-and-her shower and rainshower heads; indulgent and lavish finishes and textures. 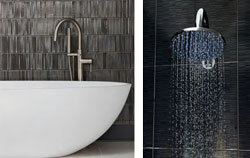 If a tub is installed at all, chances are it’s a free-standing, soaking tub with clean, modern lines. Regardless of style and design, everyone involved in bathroom renovations agrees on one thing: even smaller-scale remodels can be stressful. Top priority for renovations to the Mountcastles’ 10,000 square foot home was the master bath—in their case, master baths. Because the home was originally built with two master suites on the main level, the couple took out a wall between the two bedrooms, creating a sizeable master bedroom, with a master bath for each. Mountcastle laughed: “My husband’s bathroom was the least egregious,” but hers, to say the least, with its dark green ceiling, foiled wallpaper and pink tile, didn’t match her aesthetic. She yearned for a light, calming, functional space and began to be excited about creating it. She was thrilled that, “For the first time in my whole life, I have my own bathroom!” What she didn’t have was a workable plan. For the first time ever, Mountcastle consulted a design professional. She found in Stefanie Deel a design partner who understood her vision; together they planned the design. Retaining the bathroom’s original footprint and 14- foot ceilings, they also left plumbing lines intact for a drop-in tub, shower, sink, toilet and bidet. The marble floor was replaced with 12- by 24-inch porcelain tile, but existing radiant heat was retained. A dresser Mountcastle described as “plopped” along the wall delivered a moment of inspiration: its placement showed her that the space could accommodate a cabinet to match a granitetopped vanity—the perfect storage solution. 12- by 24-inch porcelain tiles in a monochromatic color scheme of cream, taupe and gray were chosen for walls, the tub’s deck and shower walls. 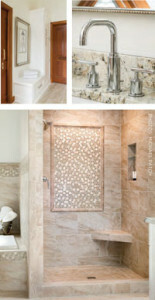 “Mary Ann wanted an accent on one shower wall,” Deel said, “We used thick, chair-rail tile to frame out a glass-and-stone, hexagon-patterned, deco tile. That pattern was also used as a border around the inset for the toilet and bidet and on the walls around the tub.” The granite countertop brings in color and patterns that pull in the existing stained wood window casing and door trim. “The bathroom has just come together,” says Mountcastle. “Don’t be afraid to bring in outside help, but be sure to choose the designer who ‘gets’ you. Most importantly,” she adds, “be patient—or at a minimum, don’t be rash.” She suggests being thoughtful and deliberate with each decision. Bryan Relyea specializes in bathroom remodels for Blue Glass. He says there are two critical elements of any bathroom remodel: giving clients what they want and ensuring that it will be structurally sound. His company typically works on older homes, which present their own sets of challenges. Remodeling older bathrooms often means installing new wiring and plumbing, all without disturbing other areas of the house. At that same job, the homeowners found a Turkish marble they loved. Relyea’s crew took the time to understand the tile; they laid it intentionally with regard to both color and grain so that the finished look was cohesive, both horizontally and vertically. A plumber is called in to move pipes before Relyea’s team runs wire and boxes; the electrician comes in to tie it all together. Relyea plumbs the walls for tile, hangs and finishes the drywall and wallpapers or paints walls. “Finally,” he said, “we install tile, after passing all applicable inspections. I do my best to give them the bathroom that they had pictured in their mind,” says Relyea. No matter what the reality shows tell you, bathroom remodels are in no way quick and easy. Teresa Julian and her husband Carl Yates had lived in their Lynchburg home for 25 years when they decided it was time to remodel. Topping the couple’s update list was the master bath; its hunter green, plaid linoleum floor and older Jacuzzi felt dated and tired. The couple works out often and they very much enjoy a level of luxe as they wash up, post-gym. Charlie Morris of Morris Construction took on construction. The linoleum got the boot and was replaced with beautiful, wood-look tile laid in a herringbone pattern, with radiant heat installed beneath. Gone too, was the tired Jacuzzi. Girten added, “I often hear, ‘I’ve only ever used it twice; it collects dust.’” In its place is a beautiful, stand-alone tub, along with a separate, large shower. Girten, who earned her degree in interior design from High Point University before launching her business on Rivermont Avenue, noted that each project is unique. Particularly challenging in this project was the bathroom’s large size. 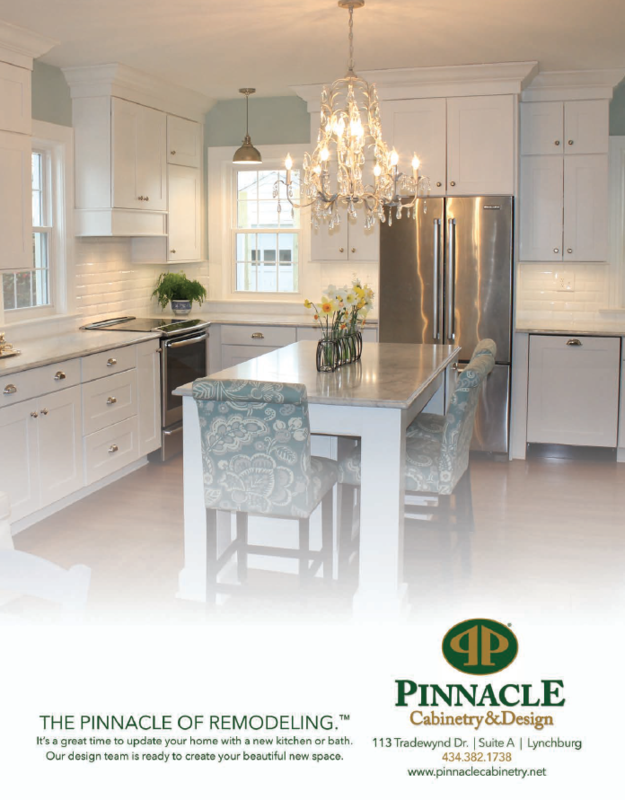 Her choices of finishes and the coffered ceiling were intended to help the room feel crisp, cozy and timeless. “The wall you see when you walk in is 12-feet tall,” she explained. “We covered it in 12- by 24- inch tile, for a focal point that was desperately needed.” Herringbone marble tile in the shower niche and floor continues behind the vanity and adds cohesion to the space. For those who need help visualizing, planning, or drawing a space, contracting design services ahead of time is crucial. Design renderings provide a plan, in addition to peace of mind in knowing what to expect. As Girten says, “Bathrooms are not cheap and renovations are stressful. I can see my clients start to relax and get excited once they get their 3-D drawings,” because they can actually visualize what the finished project will look like.